Beijing, Feb 14 (IANS) US and Chinese officials on Thursday began a two-day meet here to sort out their trade differences as the March 1 deadline for the truce in their festering trade war draws near. If the two sides fail to patch up before March 1, Washington will raise the existing 10 per cent tariffs to 25 per cent on Chinese goods worth $200 billion, taking the spat to the next level. So the Chinese and the US officials are racing against time to avert such a scenario, which, experts worry, will also have an impact on the global economic growth. 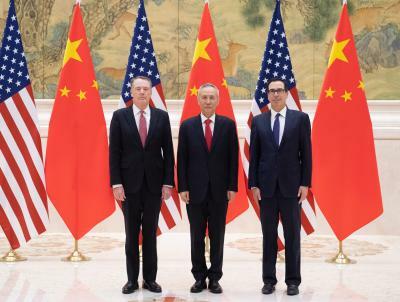 US Trade Representative Robert Lighthizer and US Treasury Secretary Steven Mnuchin met China's Vice Premier and its point man on trade Liu He, Xinhua news agency reported. Lighthizer and Mnuchin are also likely to meet Chinese President Xi Jinping on the last day of the parleys. Even though US President Donald Trump has said he might extend the deadline if something substantial is achieved, experts say a deal in this meeting looks far-fetched. "If we're close to a deal where we think we can make a real deal and it's going to get done, I could see myself letting that slide for a little while. But generally speaking, I'm not inclined to do that," Trump said earlier this week. The world's two largest economies are locked in arguably the biggest trade war in history with both sides slapping each other's goods with tariffs worth $360 billion. Trump accuses China of arm-twisting American companies to transfer technology to their Chinese counterparts and ballooning trade deficit. Beijing denies these charges and accuses Washington of containing it. The bruising trade dispute has hurt the already flagging Chinese economy which grew at 6.5 per cent in the third quarter, the slowest since 2009.